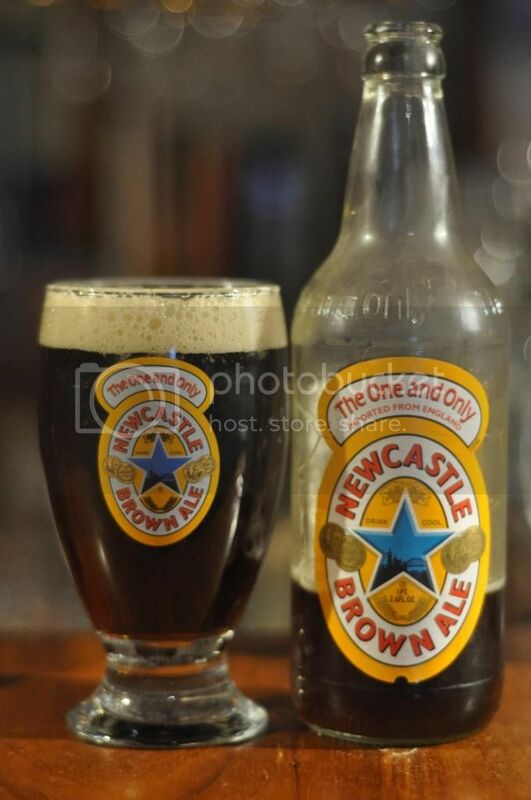 Newcastle Brown Ale is a beer synonymous with England. It's distinctive orange and blue label is known around the world. In it's homeland however it is a beer that is often derided, in my opinion unfairly. The inspiration to right this review came the other day when I was knocking back a Newcastle Brown and searching for a review I'd done on it to link to my Untappd Catchup post. I was sure that at somepoint I would have felt the urge to review this beer, which I normally have at least one of in my fridge. Strangely though, I had never felt that urge - so today I will rectify that. Onto the nose and this is the time everytime I drink Newcastle Brown Ale when I remember that this is brewed by Heineken. That said; there is light toffee/caramel on the nose and hints of roasting. Unfortunately that's where the positives stop; as the beer warms there is this unusual plasticy aroma which isn't that pleasant. In saying that the overall aroma is quite light and unless you are looking for these smells they aren't overtly apparent. Newcastle Brown Ale thankfully is a much better tasting beer than it is to smell. Initially there is plenty of sweet caramel malts before a nuttiness comes through. There is a taste similar to cola somewhere in the middle before the flavour fades to bitterness. For me the body is nice and light, but I know of a number of people who think it's a little too thin for the style. Overall, we need to remember that this is a mass produced beer. It's brewed to sell volume and appeal to the masses. With this in mind I think Newcastle Brown Ale is a particularly approachable beer, which leads people away from pale macro lagers (not that there is anything wrong with them!) and down the path towards craft beer. It's certainly not one for the connoisseur, but it is a beer I always like to have available - especially in winter. It's a serviceable beer.